Pirron Yallock is a rural village on the Princes Highway 15 km west of Colac in western Victoria. It is near the Pirron Yallock Creek which drains northwards into Lake Corangamite, about 2 km away. It is thought that 'Pirron Yallock' was derived from an Aboriginal word meaning little water. Pirron Yallock was the site of a police camp in the 1840s, until they were transferred to Colac toward the end of that decade. Although there was little water in the creek, there was also the Pirron Yallock morass and undulating plains to the east. The area immediately around Pirron Yallock was later taken up for small farms, the eastern land being suitable for grazing and vegetable growing. The western land is mainly stony rises, suitable for grazing but, by the 1880s, described as 'completely surrendered to rabbits'. The railway (1883) enabled the transport of rabbit meat and pelts to Melbourne and Geelong. The Pirron Yallock school was opened in 1874. 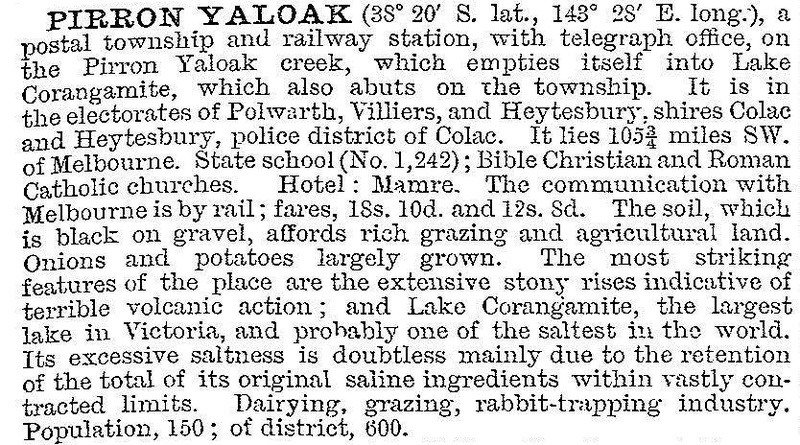 Another was opened at Pirron Yallock West (now Swan Marsh) in 1911, after the subdivision of large pastoral estates for closer settlement. A Catholic school opened in 1887. With the increase in population during the 1910s-20s a Catholic primary school was opened, and the Corolea cheese factory came into production for surrounding dairy farms. About 3 km west of Pirron Yallock there is the floating islands lagoon. Formed from an ephemeral peat swamp, the formation of a blockage and a wet year in 1952 gave permanent water on which buoyant peat attracted vegetation and small trees. The material drifts with weather changes, hence the 'floating islands'. The area is a public reserve, partly fenced with stone walls made during the 1860s-80s to keep out rabbits. Pirron Yallock has the Mamre Hotel, a Catholic church, a Catholic primary school and a recreation reserve. The former railway station (1894) is heritage listed. There is a motel (1958) opposite the floating islands reserve. The local State primary school is at Swan Marsh.